Hello! Today's card was inspired by my friend Carol! When I saw the cards she made I knew I had to case them. 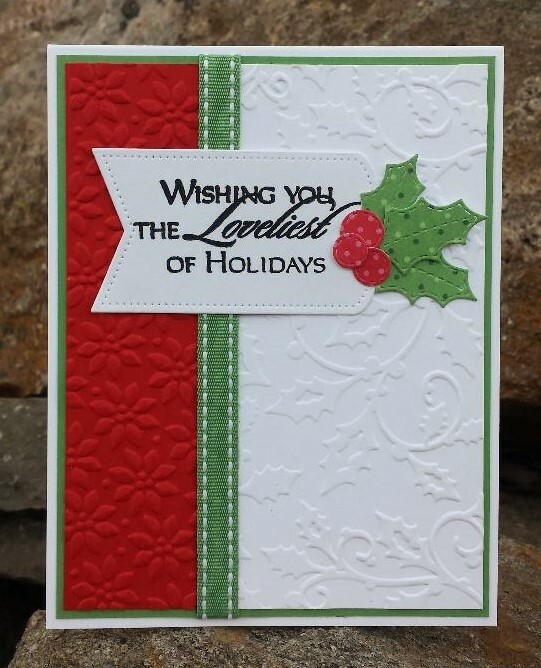 Here is the card/s I cased, Traditional Christmas Colors. I wish I had the holly embossing folder she used because it's so pretty and I love all the berries but made due with this one. My ribbon is much narrower and I used some scraps of DP for my Holly. Oh and I add an extra layer/base. That's it for now! Be sure to stop back by tomorrow for the new Tuesday Morning Sketch. List of challenges are below. Oh, I LUV this card. The embossing is beautiful, and the ribbon is just the perfect size (to me) because it adds to the card but doesn't cover too much of your embossing. I really like the use of the DP for the punched holly leaves. It adds another dimension to the card. Everything is just perfect! Gorgeous card, Janice! 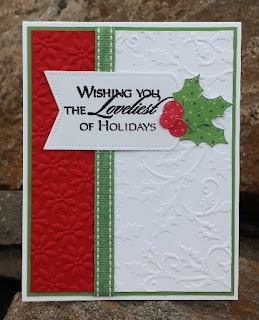 I love the traditional colors and the embossing folders you used! Carol sure can rock those Christmas cards, can't she?! Great job on casing Carol's card! They are both perfect for the upcoming holiday! I love this. I think I might have this embossing folder, it's very pretty with the traditional Christmas colors. Ooooh, I love this one too Janice, what a fabulous design. The colours you chose are festive and lovely, and I really like the gorgeous holly die cut. Great choice to cut the leaves and berries from patterned paper. Beautiful embossing in the background as well. Great job. Great card - thanks for sharing it with us at the Crafty Friends Challenge Blog.